Belkin OmniView ENTERPRISE Series Dual-Port PS/2 KVM Cables provide maximum connectivity between your PS/2 servers and OmniView ENTERPRISE Series KVM Switches. Our coaxial video cabling preserves video strength and clarity at higher resolutions, and the dual-port design delivers built-in cable management for your convenience. 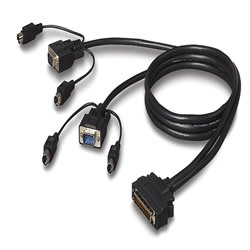 Available in 1.8m, 3m, 4.5m and 7.6m lengths, this Dual-Port PS/2 Cable works with OmniView ENTERPRISE Series KVM Switches. • Comes with a Belkin Lifetime Warranty.